I was watching a YouTube video the other day where Lee Anderton gets a guitar lesson from Ariel Posen. Ariel tries his best to teach him a few things in a very thorough and well-meaning way, but about half-way through Lee says something along the lines of, ‘Just teach me the quick and dirty way to do things, I’m a middle-aged man who doesn’t have the time (or the patience) to practice scales for 8 hours a day’, which is both totally valid and completely doable on guitar as it’s one of the few instruments that lends itself well to a wide range of methodologies, be they theory-based or the other extreme, which is what we’re going to look at in this book. 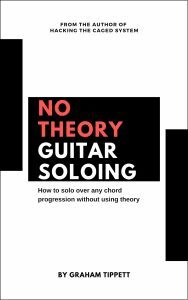 I won’t deal with pentatonic scales here as you’re probably already well-versed in those and are looking to be able to solo over simple and common chord progressions or add more variety to your improvisations. All the music theory terms you’ll find in this book are for labeling purposes only and will help you recognize these concepts in songs or pieces you already know; they’ll also help you find the information on the fretboard as and when you need instead of fumbling around. What’s more, due to the simplicity of this approach, you’ll be able to reduce your thinking to a minimum and concentrate on making a musical contribution to whatever situation you find yourself in and making jamming/playing out a far more enjoyable experience. I love this approach and often teach it to people who don’t want to practice 10 hours a day, are not interested in theory or knowing the whys and wherefores of everything. They just want a straightforward “if you learn this and play it here, it’ll sound good” method, so that they can express themselves in a jam session, solo with more than just a pentatonic scale, or play out on the weekends. If you have even half an hour a day to play/practice guitar,you can make a world of progress with your soloing by using this method. Available now in PDF format! Also available on Amazon Kindle, iBooks, and Google Play.